New Leaf Community Markets in Santa Cruz has several events this month, including ones to make “healthy holiday eating” easier. Here are some highlights; these are all at the Westside Santa Cruz location at 1101 Fair Ave. (831-426-1306). There is also a holiday macaron class on Dec. 20 but it’s already sold out – if you’re interested in that topic, try to sign up early next year! Preregistration is required—even for the free class—at newleaf.com/events. Healthy Holidays: Special Diets, 1-2 p.m. If you get stressed about what to eat or how to stick to your diet during the holidays, help is here! Gain ideas for managing your gluten-free, dairy-free or anti-inflammatory diet stress-free! Enjoy tastes of featured recipes. With Certified Nutrition Consultant Madia Jamgochian. Free. Raw Holiday Desserts, 6–8:30 p.m. In this hands-on class, attendees will create four different delicious, healthy, plant-based desserts that everyone can enjoy without guilt! Make Raw Beet Treasure Cake, Apricot Walnut Chews with Cardamom, Chai Pecan Pie and Persimmon Cashew Sorbet. “Mature children” welcome to attend with adult. With Chef Beth Love, author of Tastes Like Love cookbook series. $45. 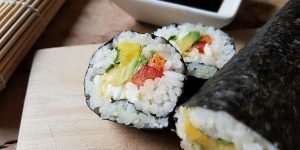 Intro to Sushi Making, 6–8 p.m.
Join Sushi Chef Carlos Mayorga and learn how to properly assemble your own rolls from scratch and discover your own style! Learn technique, tradition, prep and how to plate your finished masterpieces. Come hungry. $25. Whether you need to shop for a holiday feast or check some folks off your gift list, Whole Foods Market locations in Capitola, Santa Cruz and Monterey have lots to choose from—including the always-dependable gift card idea (ones for the market itself or for other retailers). Customers need to place orders for holiday dinners two days ahead of their desired pick up date. Food is available for pickup Dec. 18-24, and then again on Dec. 26 (WFM is closed on Christmas Day). Order in person or online. Other “gifts with a cause” include ones where part of proceeds goes to Whole Planet Foundation to help alleviate poverty worldwide. These include Alaffia trios (coconut oil triple-milled bar soap or whipped body butter); one percent benefits WPF. Or if you buy west elm kitchen products made from upcycled denim—such as potholders—a dollar from each purchase goes to WPF. In addition, they have gift cards for sale where one percent benefits the Whole Kids Foundation (which aims to support schools and inspire families to improve children’s nutrition and wellness). These include Chipotle and Best Buy physical gift cards, and Starbucks digital cards. There are room sprays and handmade soy wax candles from Thistle Farms; scents include lavender & lemon (Gratitude) and Geranium & Citrus (Hope). Thistle Farms is a community, sanctuary and social enterprise led by women survivors of trafficking, addiction and prostitution. It provides housing, recovery support and education. Each spray or candle purchase directly benefits the women who made it. WFM wine experts have compiled a list of “10 favorite wines for the holiday season.” Available online, each wine has several suggested food pairings plus a recipe for an additional food pairing. Two examples: Andover Estate Pinot Noir goes well with items like Sartori Herbs des Provence BellaVitano cheese or roasted winter vegetables, or with the dish “Easy Porchetta Pork Tenderloin” (recipe included). Autoritas Sauvignon Blanc pairs well with Vermont Creamery Coupole cheese, poached white-fleshed fish, or “Bay Scallop Linguine with White Wine and Parsley” (recipe included). 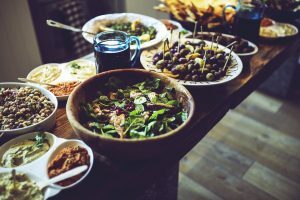 There are lots of other enticing articles on the WFM blog, including ones with recipes like “holiday cakes worth celebrating” (includes mini chocolate ricotta cakes and cinnamon-almond olive oil cake) and “holiday appetizers” (how about sweet potato bacon bites, spinach bites with honey mustard, or pigs in a blanket with cranberry-mustard dipping sauce? Ok now I’m hungry!). This mild ash-ripened goat cheese with earthy notes and a subtle hazelnut flavor is a visually stunning addition to any cheese board. The only three-time winner of the American Cheese Society Best of Show, this cheese has a sweet, broth-like flavor with notes of butterscotch and fruit. A silky, creamy soft-ripened goat cheese packed with truffles. Deep floral, herb and mushroom flavors. An American original! This creamy, raw-milk Alpine cheese is infused with flavor from herbs added by hand during the ripening process. This classic cave-aged sheep’s milk blue cheese shows rich spiciness, complex layers of flavor and a smooth texture. An American take on a traditional French cheese, sourced from milk from one farm. Delicate and smooth with rich creamy flavors and nutty notes. Non-GMO Project verified. As I mentioned in my Thanksgiving article, WFM’s 2016 holiday food shopping guide features selections such as traditional turkey dinner for eight ($99.99). This comes with a fully cooked 10-lb. oven-roasted Diestel turkey, four pounds each of herb stuffing and mashed potatoes, a quart of turkey gravy, a pint of cranberry relish, 16 dinner rolls, and a nine-inch traditional pumpkin pie. You can also order turkeys (cooked or uncooked) and ready-to-eat sides a la carte. Whole Foods Market Santa Cruz is located at 911 Soquel Ave. Call (831) 426-9901 for more information. Whole Foods Market Monterey is at 800 Del Monte Center, (831) 333-1600. 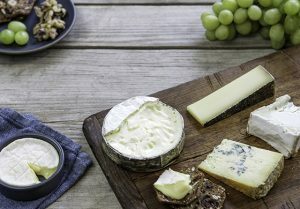 Attention cheese lovers: there is a cheese night from 6 to 7:30 p.m. Tuesday, Sept. 13 at Whole Foods Market stores across the country; this includes the local Santa Cruz and Capitola stores as well as locations in the South Bay and San Francisco Bay. Customers are invited to visit for free samples, and each store will have an expert or Certified Cheese Professional available to talk about characteristics and flavor profiles of Alpine-style cheeses and answer questions. They will have cooking tips, too. 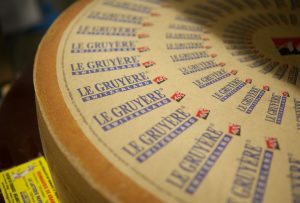 Kaltbach Le Gruyère: Made in Switzerland, this cheese is matured for 12 to 16 months and is washed regularly with brine. Flavors are complex, ranging from caramel, nuts, notes of mushroom, hay and fruit, and crunchy, salty granules add an extra boost of flavor. Emmentaler: This famous cheese – the Swiss with the holes – has been in production for 400 years in the valley of the Emme. It has a buttery, delicate and nutty taste. Le Marchel: Handmade in the mountains of Vaud by Jean-Michael Rapin and his sons since 1992, La Marchel has the distinctive aroma of hay, and herbs impart a very rustic and savory flavor. Pavino: Exclusive to Whole Foods Market, this Alpine-style cheese is made in Wisconsin but stands up to any made in the Alps. It is nutty, fruity, and robust with a sweet milky finish, and is also sprinkled with crunchy salt crystals. Kalthbach Alpine Extra: Aged in caves located on the edge of the Wauwiler Moos area in the canton of Lucerne, Switzerland, this award-winning, raw-milk, semi-hard cheese offers a tangy aroma and complex flavor. San Francisco WFM locations are teaming up with Sur La Table to invite customers to cook with Alpine-style cheeses. The companies are giving away a Le Creuset fondue set and Breville panini press via the @wholefoodsmarketsf Instagram account. Users can follow the channel and tag a friend on relevant posts to enter to win. Whole Foods Market Capitola is at 1710 41st Ave. Call (831) 464-2900 for more information. Santa Cruz business The Healthy Way recently achieved two milestones—30 years as a Santa Cruz business and serving 10,000 clients!—and owner Cheri Bianchini is celebrating with a fun, informative food and health fair Saturday that’s free to the public. The event, Sept. 10 from noon to 4 p.m., will feature lots of healthy food sampling and activities. There will be tastes of Ginger Carrot Soup, Emily’s Apple Bars, Plum Cobbler, Almond Dip with assorted crackers, Healthy Way Chocolates, and Gourmet Balsamic Vinegars, all prepared by Chef Julie of The Healthy Way. 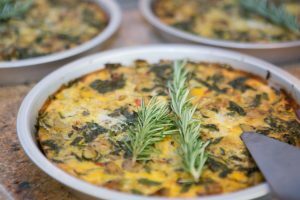 Chef Adrienne Meire will do a cooking demo of Healthy Way Harvest Salad, Vegetable Frittata with Sweet Potato Crust (see recipe below and photo above) and Curry Quinoa Salad, all of which can be sampled. Sugar-free chai will also be available. Workshops will be given on Yoga, Qi Gong, mindfulness eating, and hypnosis for weight loss and stress reduction, and a panel of clients will share their success stories. See schedule below. There will be information booths on topics such as nutrition and acupuncture for appetite control. People can have their blood pressure checked, and B-12 and fat-burning shots will be available. Special pricing on The Healthy Way programs will be offered. Music will be provided by KPIG; the station will broadcast live from 1–3pm in The Healthy Way parking lot. A raffle with $5 tickets will benefit Hospice of Santa Cruz County, an organization The Healthy Way has been supporting for many years. Read more about the event here. 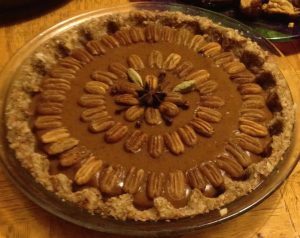 Date/Time: Saturday, Sept. 10, noon to 4 p.m.
-Coat a 9” round pie dish with cooking spray and fill bottom of dish with a layer of sweet potatoes. -In a fry pan, spray vegetable oil and add chopped onion until translucent. Add zucchini and mushrooms. Cook till tender. Add spinach till wilted. Remove from heat. -Pour cooked vegetables into prepared sweet potato pan. -Combine with a whisk the milk, salt/pepper and eggs and pour over vegetables. -Sprinkle with feta or the vegan cheese alternative. 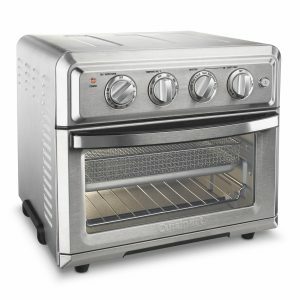 -Bake at 375F for 35 minutes. – Let stand 5 minutes and then enjoy! Did Mother’s Day sneak up on you? Perhaps it’s time to organize a Mother’s Day brunch at home, in which case Whole Foods Market has a few ideas to help. And at WFM locations in Northern California—including the local Santa Cruz and Capitola stores—several delicious, brunch-friendly cheeses are currently on sale. Guffanti-Robiola Langhe Two-milk: this rich, earthy cheese is made with cow’s and sheep’s milk. It’s currently on sale for $23.99/lb., discounted from $29.99/lb. WFM Northern California Regional Cheese Buyer Francesca di Donato suggests pairing with items like orange jam, pumpkin-ginger jam, fresh fruit, and/or walnut bread. Cowgirl Creamery – St. Pat: St. Pat is the Creamery’s seasonal cheese. The green rind commemorates the arrival of spring. These creamy wheels are wrapped in wild nettle leaves, which di Donato explains impart a smoky artichoke flavor. It’s currently on sale for $23.99/lb., discounted from $29.99/lb. di Donato recommends pairing with dry wine or an Irish-style lager. Marin French – Supreme Extra Creme Brie: With a smooth texture and slightly sweet flavor, this delectable cheese lives up to the “lush and buttery” description promised on its label. It utilizes high quality milk from neighboring Marin County dairies. This brie comes in a wheel, and is currently on sale for $23.99, discounted from $29.99. di Donato recommends pairing with California sparkling wine, Petit Syrah, or IPA. I enjoyed trying it with a small serving of “figs and olives” from the Capitola store’s olive bar. Mitica- Cana de Cabra: This creamy goat milk log hails from Murcia in the southeastern part of Spain. The flavor is mild, yet satisfying, with citrus notes. It’s currently on sale for $13.99/lb., discounted from $16.99/lb. Di Donato’s pairing ideas: for drinks, a lean white wine (Albarino, or an unoaked Sauvignon Blanc) and for food, almonds and/or fig spread. If you like cheese but want something more “brunch-traditional,” how about some quiche? WFM offers several ready-to-eat varieties in small ($5.99) and large ($14.99) sizes. I recently sampled a four-cheese quiche (Gouda, Parmesan, Swiss, and feta), and it was very good. On a budget for Sunday brunch? I found this frittata recipe while browsing the “budget-friendly recipe” section on the WFM blog. You can incorporate leftovers in it, too. Last but not least, don’t forget to include flowers when developing your brunch plan. 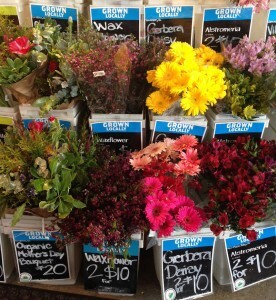 They are always a wonderful way to make a woman feel appreciated and Whole Foods carries lots of great arrangements. When I was at the Capitola location yesterday, I saw many vibrant bouquets, and most of them were made from flowers grown locally. Some of them are also fair trade. These are called “Whole Trade” flowers, and when purchased they donate funds to local community organizations that support flower farm workers. “Whole Trade provides more money to producers, ensures better wages and working conditions for workers, and cares for the environment,” says Lily Hussey, Marketing and Community Relations Lead for Whole Foods Market, Northern California & Reno. “Also, they donate 1% of sales to Whole Planet Foundation.” Learn more about Whole Trade. No matter what you decide to do for your Mother’s Day food, I hope it’s a very happy day for you! On Twitter? Please follow me @santacruzfoodie. It’s Day 9 of Santa Cruz Restaurant Examiner/Santa Cruz Foodie’s “12 Days of Christmas Giveaway.” See end of article for how to win a “pro pizza pack” from pizza guru Tony Gemignani of San Francisco restaurant Tony’s Pizza Napoletana. Still have a couple holiday gifts left to buy for some foodie friends or family? Keep reading! 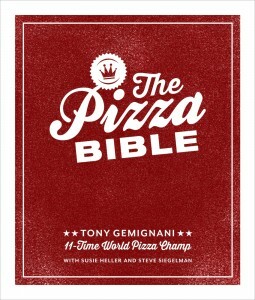 The Pizza Bible: Got any aspiring pizza chefs on your holiday gift list? When Ten Speed Press published this book by chef Tony Gemignani last October, Eater National called it “one of the most anticipated cookbooks of Fall 2014.” The book is a comprehensive guide to pizza making, with more than 75 recipes covering nine regional styles including classics like Neapolitan, Roman, Chicago, and what some call “pizza sub-specialties” like St. Louis and Californian. Recipes include New Jersey tomato pie, organic three cheese, fig/almond/Monterey jack, calzone with meatballs or spinach, pepperoni and sausage, and Calabrese “diavola.” The Pizza Bible has been described as a “complete master class in making delicious, perfect, pizzeria-style pizza at home… (including) the ins and outs of starters, making dough, assembly, toppings, and baking, how to rig your home oven to make pizza like the pros, and all the tips and tricks that elevate home pizza-making into a craft.” Gemignani is an 11-time world pizza champion and he owns 13 restaurants across Northern California and Las Vegas including Tony’s Pizza Napoletana, Slice House at AT&T Park in San Francisco, Pizza Rock in Sacramento and Las Vegas, Tony’s of North Beach, and Slice House by Tony Gemignani in Rohnert Park. He is also proprietor of the International School of Pizza in San Francisco where he certifies chefs from around the world in various styles of pizza. More pizza cookbooks: Other books that might pique a pizza-lover’s interest include “Flour Water Salt Yeast: The Fundamentals of Artisan Bread and Pizza” by acclaimed Portland baker Ken Forkish (of Ken’s Artisan Bakery and Ken’s Artisan Pizza) and “Pizza on the Grill: 100+ Feisty Fire-Roasted Recipes for Pizza & More” by Elizabeth Karmel and Bob Blumer. “Flour Water Salt Yeast,” the #1 best seller from Amazon.com’s “Pizza Baking” category, features a tutorial on baker’s percentages, advice for manipulating ingredients ratios to create custom dough, tips for adapting bread baking schedules to fit your day-to-day life, and recipes such as sweet potato and pear pizza and golden beets and duck breast “prosciutto” pizza. Pizza on the Grill includes recipes like Kung Pao cashew chicken pizza, pulled pork pizza, and blistered corn, asparagus, and pesto pizza. One reader will win “Tony’s Pro-Pizza Pack,” graciously donated by chef/author Tony Gemignani himself. 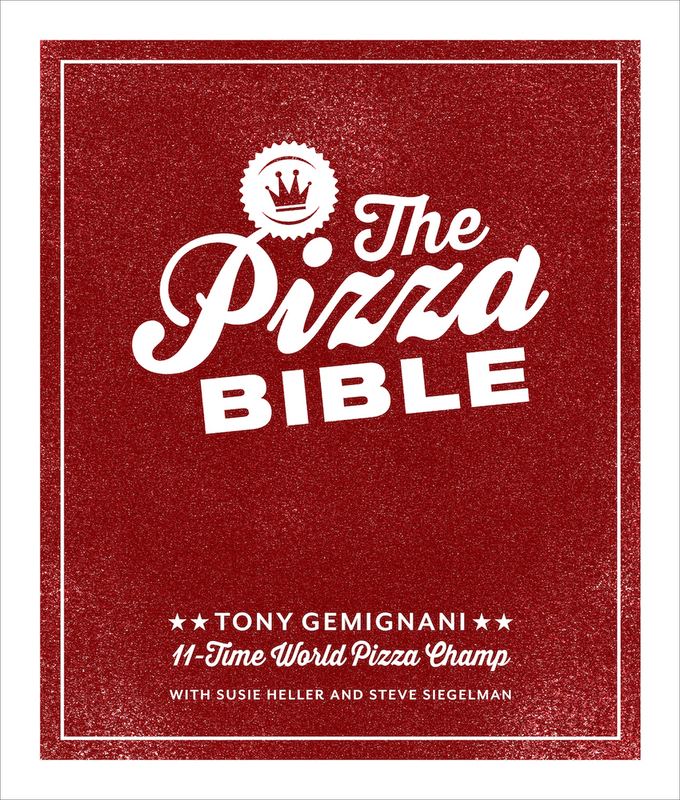 It includes a copy of Tony’s cookbook “The Pizza Bible,” a pack of his custom blend California artisan pizza flour, and an Italian professional pizza peel. To enter, email your name to tfatemi@gmail.com by 9 pm. Tuesday, Dec. 22 and include the word “pizza.” The drawing will take place the next morning and the winner will be notified via email. Employees of Examiner.com are not eligible for the promotion. Good luck and happy holidays! Follow me on Twitter @santacruzfoodie. As we move through fall and approach the winter, many of us crave soups and other comforting dishes. Of course, homemade soup is hard to beat, but sometimes pulling one together can be tough for busy parents or those who don’t own a crockpot. In September, Annie’s released a delicious new line of organic soups. 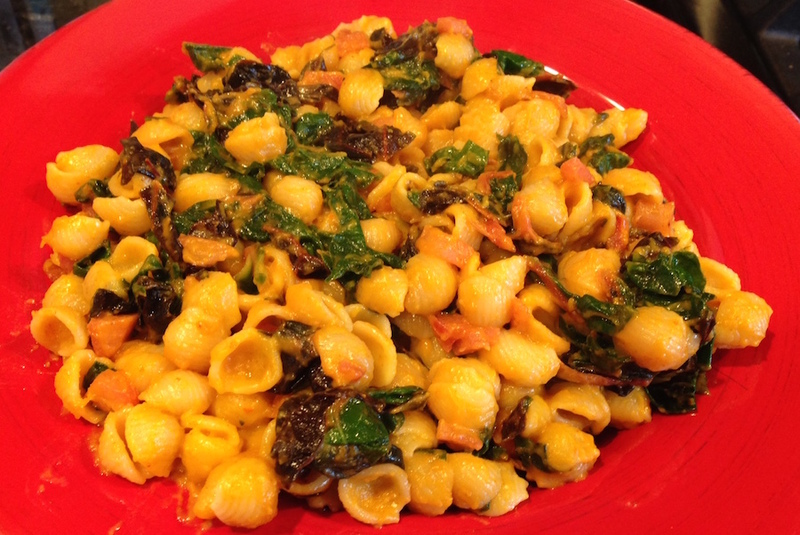 Three of the five are vegetarian: tomato, creamy carrot & bunny pasta, and creamy tomato & bunny pasta. The carrot one has a nice sweetness and provides a lot of vitamin A, so it made my daughter and me happy. See end of article for a few more details on the soups. I’m not vegetarian myself, but I know more and more individuals who are. I tried out a seasonal recipe from Annie’s recipe web site for pumpkin mac & cheese, and decided to make a vegetarian version by skipping the bacon-bit garnish (see my result in photo above). It didn’t taste like anything was missing; I’ll definitely be making this savory dish, which includes chard and apple, again. Because I had it on hand, I also substituted Annie’s organic vegan shells for the “shells with real aged cheddar” that the recipe called for. If you are vegan and want a quick recipe, Annie’s has one for spicy vegan bacon mac and cheese. When searching for a few more vegetarian fall recipes, I discovered that Lundberg Family Farms has lots of options. I haven’t made these yet, but I look forward to creating kale and rice rolls and brown jasmine rice with pecans and orange honey glazed tofu, which is actually vegan. You can sort their recipes by vegan and/or vegetarian and/or course type (like appetizer), too. They also have recipes that feature their new American-grown organic tri-color blend quinoa, and their sprouted risotto. If you haven’t tried these yet you’re in for a treat. The sprouted risotto made with organic whole grain brown Arborio rice comes in three varieties including cheddar/pepper and sweet corn/bell pepper. They are good on their own, but it’s also fun to use a product you already like as an ingredient for a new recipe. If you do have time to make some vegetarian soup from scratch, let me recommend a couple cookbooks I became familiar with when doing research for a Santa Cruz Sentinel article; they were both published in 2013. Mollie Katzen’s “The Heart of the Plate: Vegetarian Recipes for a New Generation” includes recipes such as Black-Eyed Pea, Squash, and Shiitake Stew and Yellow Split Pea Dal (the latter is perfect for beginning cooks). Before this book, Katzen was already famous for writing “Moosewood Cookbook” among others; The New York Times and Amazon both named “The Heart of the Plate” a best book of the year. “Bountiful: Recipes Inspired by Our Garden” by Diane Cu and Todd Porter includes Hearty Celery Root and Red Lentil Soup. If you’re not vegetarian, the Curried Kabocha Squash and Chicken Stew recipe is one that I’ve made and loved—it’s an easy recipe with only a few ingredients. Foodies out there might already know Cu and Porter through their food/travel/photography, blog WhiteonRiceCouple.com. More on Annie’s soups: Both tomato varieties offer a half-cup of vegetables per serving, while the chicken-based soups use only organic chicken and broth with no antibiotics added. All varieties are made with NO artificial flavors, synthetic colors, preservatives or high fructose corn syrup. More on Lundberg: All of their products use organic rice and/or quinoa.